This post is part of our blog series celebrating 125 years of the BERNINA company. 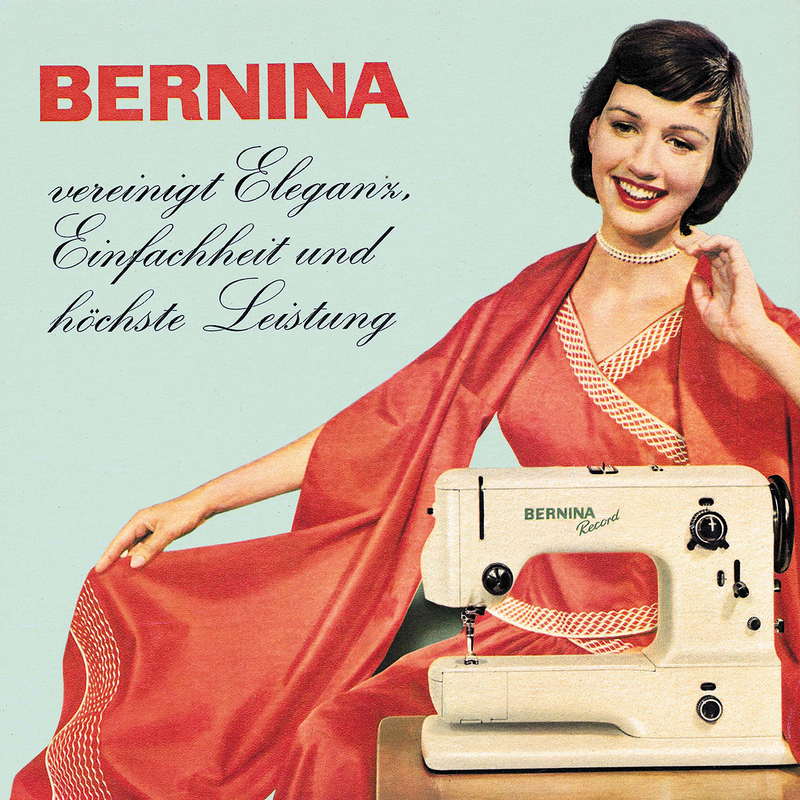 Each post will bring you a little more of the history of BERNINA, along with modern inspiration. For more information on this series, and earlier posts, click here. 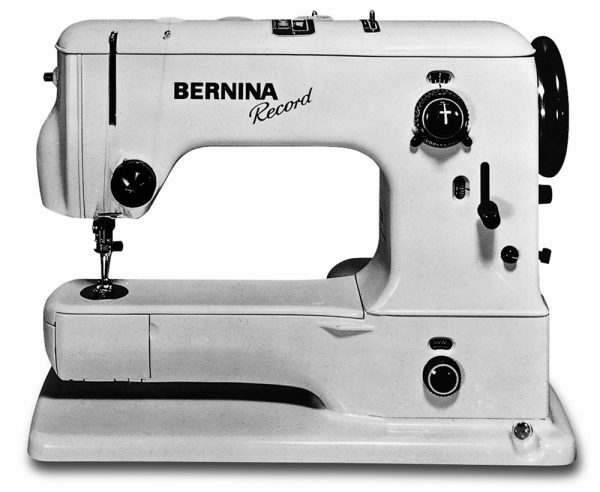 In 1954, BERNINA marketed the first sewing machine with a patented clip-on presser foot, invented by Fritz Gegauf to make sewing easier. 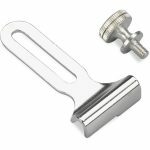 Without fiddling and screwdrivers, the presser foot is simply loosened with a lever and can be easily changed with one hand. 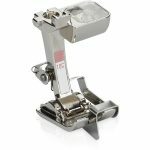 The clip-on presser feet are a patented feature and the original mechanism design is still used today. The semi-automatic buttonhole function was also available at this time, on Model 530. Eventually, in 1986 with the first computerized sewing machine, Model 1130, the fully automatic buttonhole and stitch pattern memory options were available. 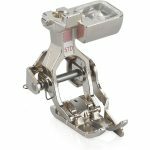 Today, the BERNINA accessory line includes over 60 presser feet, not included coded and dual feed versions of certain feet in our line. No matter the project you tackle, there is a BERNINA accessory designed for whatever task you need to accomplish. Being equipped with the right tools will instantly improve the quality of your handmade projects! Much of my experience with sewing is as a quilter. In the past year or so, I have been working to expand my skill set in garment fitting and construction and there are a few BERNINA presser feet and accessories which come in especially handy for many of my projects! This foot has become one of my favorites. Topstitching is a finishing detail that is a great indicator for how well a garment is constructed. I always pay attention to this in my ready-to-wear purchases and it was important to me to take the time to get it right when learning to do my own garment construction. 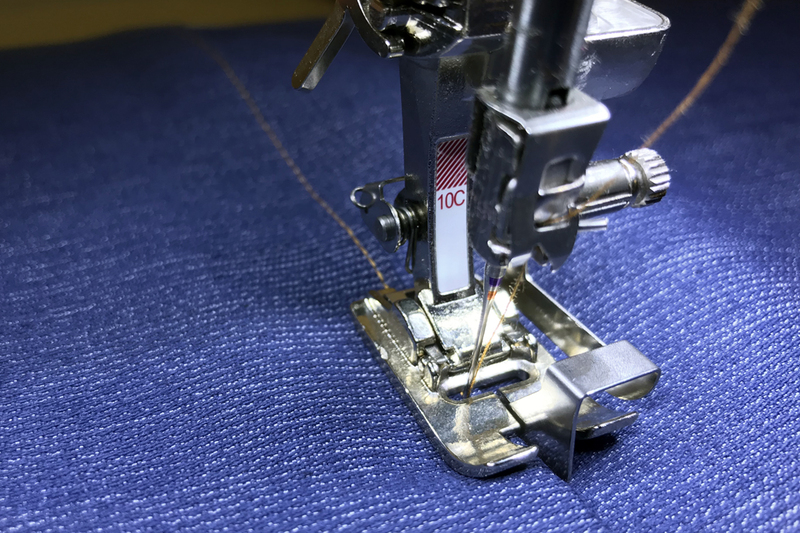 Line your seam up with the center guide of the #10 foot and adjust your needle position accordingly—you can step your needle over only two or three positions for neat edgestitching on your seams or push it all the way over to five for more pronounced topstitching. Use it on seams, patch pockets, you name it. BERNINA has a few different options when it comes to patchwork feet and you may prefer one more than the others! The key with these feet is that they are designed for a straight stitch. The opening on the presser foot is just large enough for the needle which means there is more contact between your fabric and the presser foot and thus more control. 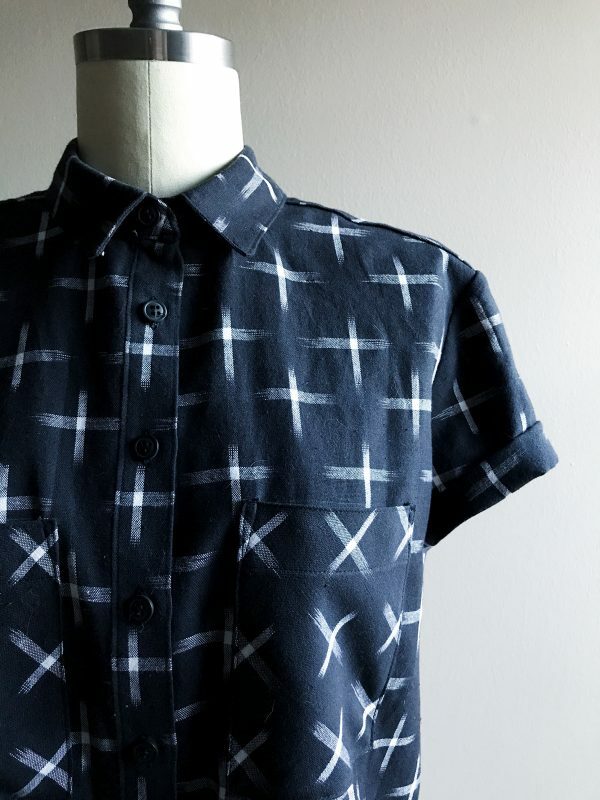 When paired with the straight stitch plate, this combination will make sewing with fine and delicate fabrics (like cotton lawn, silk, or rayon) simple as can be. 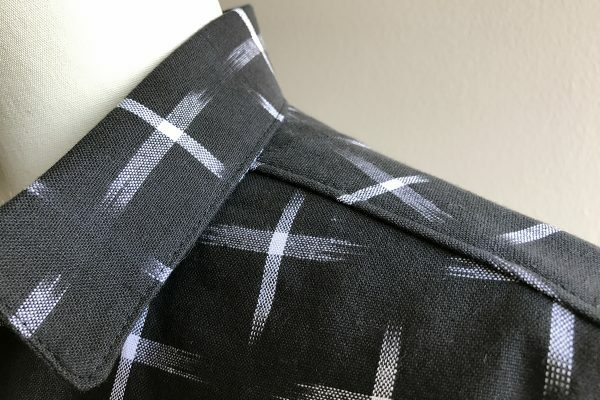 As a trained quilter, I am in the habit of sewing everything with a ¼” seam allowance so when I switch to sewing garments, I need a reminder to give that seam extra space. Attaching the seam guide and setting it at the suggested seam allowance (1/2” or 5/8” on most garments) keeps my seams consistent which results in a better fit. Hot tip: If you’ve got the BERNINA Patchwork foot #97D, you already have the seam guide! It comes with this foot but you can buy it separately. Ah, buttonholes. Why is something so small so scary? It’s such a basic closure! People have been sewing buttonholes for hundreds of years! There’s no reason to fear the buttonhole. Using the BERNINA Buttonhole foot with slide #3A on my BERNINA 590, all I need to do is hold my button up to the screen on my machine and it will know automatically what size to stitch out the buttonhole. Just trust the machine. Then, make your markings for the coordinating button and the BERNINA Button-sew-on-foot #18 will sew them on! 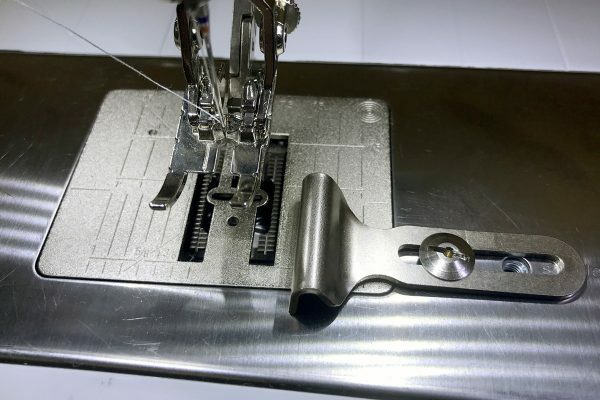 Use the screw on the right side of the presser foot to adjust the height of the center toe on the foot—a higher position will create a longer thread shank in your button (great for bulky fabrics) and a lower position creates a shorter shank (for thin fabrics, decorative buttons, or hook & eye fasteners). One of the joys of sewing on a BERNINA machine, for me, has been seeing the quality of my work improve. 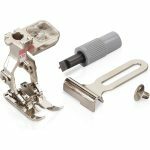 I have been sewing most of my life but taking the time to understand the engineering behind all of these presser feet and accessories, and use them appropriately, has completely changed the way I sew and I hope it does the same for you! I love the quarter inch foot! It really helps with my piecing for quilts. I just recently used the Edgestitch foot 10 for the first time and liked it a lot. I think I’m quickly becoming a presser foot junky! Even have the Bernina app on my phone to keep track of them so I don’t get too carried away and accidentally get duplicates. where did you find the Bernina app for your phone? Hi folks! There was once an app listed in the Apple app store as a guide to BERNINA presser feet. It had not been an active project through BERNINA International for a number of years and has since been removed. If you have downloaded the app, just be aware the information is not current and to double check with your local dealer or bernina.com! My favorite is the edgestitch foot! I use it for everything! I have owned a Bernina for 40 years. I just bought a new 770 and I love it. My 40 year old Bernina record was still going strong. I love the new feet and have purchased several. 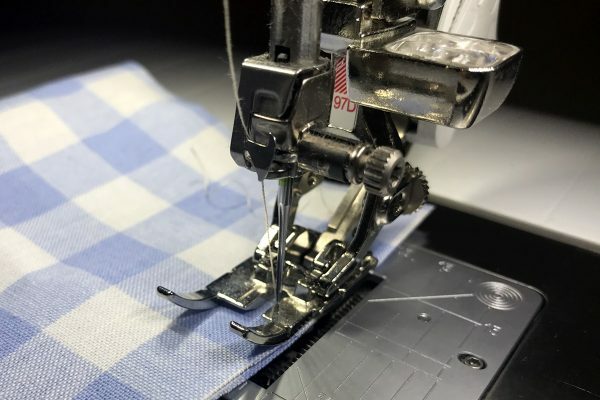 The Bernina Walking Foot is a great accessory that makes it easy to sew a variety of fabrics, and quilting is a dream. A close second is my trusty ¼ inch foot — a true lifesaver and a spot on, professional looking seam every time. Love my Bernina! my favorite foot that i seem to continue to go back to is the hemming foot. Do lots of alterations and this foot works beautifully for those invisible hems. The 57 is my current favorite!!!! Subject to change as I learn to do more on my machine! I might as well try to decide which of my three sons is my favorite. Each has his own strengths. Whichever foot I am using at the time is my favorite. They are all great. I love all of these feet. I’m least confident using the ruler foot. But with practice, I know I’ll get confident and competent.